You heard Carrollton on television over the last couple of weeks during the NFL playoff games. You heard them during the 2018 Olympic Games. You might have seen the recent Jeep commercial playing “Made for This.” Now you can hear them live on the Vineyard. 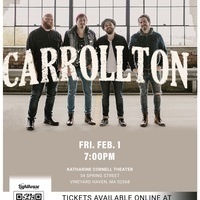 Carrollton will be playing along with opening act, Collington.